Multinationals have promised changes, but consumers are still being exposed to dangerous health risks due to microplastics. Amsterdam, February 15, 2017 – A recent investigation by the Plastic Soup Foundation (PSF) found that all large multinationals are still adding microplastics to their cosmetic products. Microplastics are pieces of plastic smaller than 5 millimeters in size that are linked to large environmental and health problems. UNEP (United Nations Environmental Program) and TAUW revealed there are at least 67 different sorts of microplastics used in these cosmetic products. It is therefore almost impossible for consumers to buy plastic-free products. Together with its Beat the Microbead partners, the Plastic Soup Foundation is calling for a worldwide ban of the use of plastics in cosmetics. On February 14th (Valentines Day) the Plastic Soup Foundation began a Twitter campaign directed at the microplastic problem. The Twitter campaign reached over 100,000 people within the first few hours after launch. The organization examines what kind of damage a lipstick kiss can cause. Together with 38 other NGOs they address brands including Maybelline, Clinique, Rimmel, MAC Cosmetics and HEMA about the use of different microplastics in cosmetics. Where it was previously thought that microplastics come mainly in scrubs, toothpaste and nail polish, the investigation shows that they are also used in lipstick, mascara, deodorant and other personal care products. 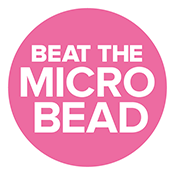 With the help of consumers, the Beat the Microbead coalition is hoping to create a worldwide ban of plastics in cosmetics. In the past, the Plastic Soup Foundation successfully campaigned against microplastics in cosmetics, the so-called ‘microbeads’, and helped to get them banned. In response to the campaign ‘Beat the Microbead‘, producers including Unilever and Johnson & Johnson agreed to no longer use microbeads in their products. But where it was first believed that there were five sorts of microplastics used in cosmetics, UNEP and TAUW discovered that there are, in fact, at least 67. The United Nations Environmental Program showed that there is much more plastic in cosmetics than initially thought. This troubling increase means it is extremely difficult for consumers to use cosmetics without plastic. Besides the fact that consumers daily and unwittingly take part in the growing ‘plastic soup’ in our oceans, these microplastics also bring health risks. Because of their size, they can’t be filtered out of our waste water. In addition, plastic doesn’t decay and they are often a source of toxins, particularly endocrine disruptors and plasticizers.